This class focuses on socialization and is designed to teach your puppy basics including Sit, Here, & Loose Leash Walking. This dog training class also covers problemsolving ideas for potty training, chewing, teething, crate training, digging and more. Helping owners to communicate with their pet by training the basics: Sit, Here, Loose Leash Walking, Leave it, & Give. This class also addresses challenges such as jumping, barking and digging. Review learned behaviors, add commands for Wait, Place, and Down, practice commands with added distraction, gain reliability. Daily drop off: where your dog will get the same opportunity to experience healthy pack relations while working on problems of your desire at a rate of $60.00 per day. Week-long session: where your dog will get time away from home as well as the same opportunities as the daily drop offs at a rate of $200.00 per week. at its commencement, will be your first opportunity to visit and give us an hour. 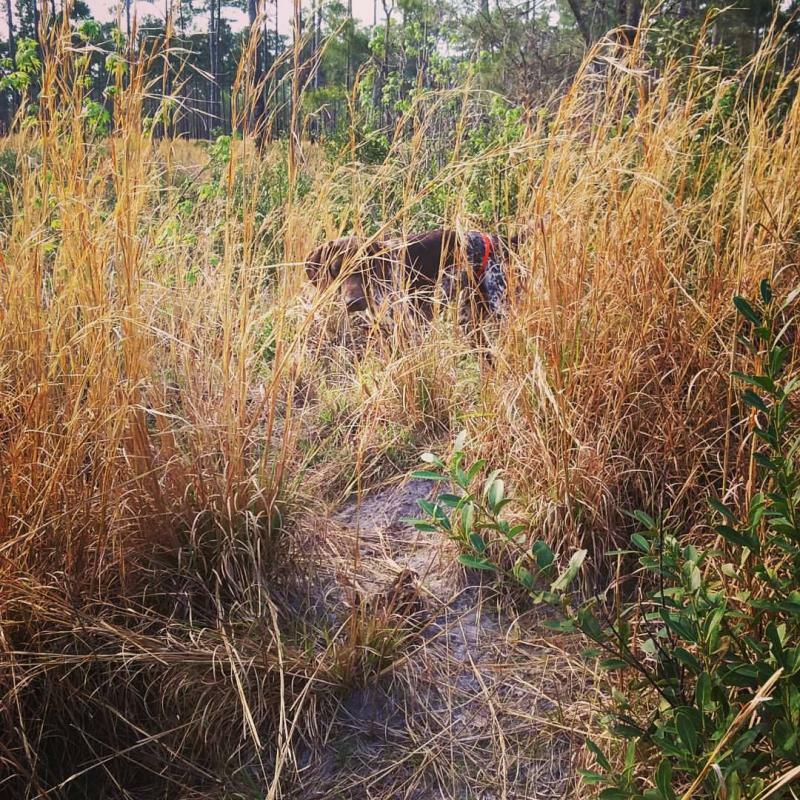 You can expect your dog has learned how to use you for guidance while hunting for cover. When approaching cover, he/she has learned how to use smell verses sight to locate game; which will help develop that natural pointing desire. Your dog has been shot over and has been given the opportunity to discover their natural retrieve. Lastly, your dog has started to gain understanding and its position in a pack environment. This stage in training elevates what we expect from your Pointing Dog. At this level, we expect your dog to go with us, come to us, and to stand still. It takes four weeks to establish the nonverbal points of contact. At commencement, you are again invited to spend an hour and see the progress. You can expect that your dog moves off lead with you in heel position; while hunting, your dog will go left with you when you go left; will go right with you when you go right, and will come back to you when you are idle. Your dog will have also learned a second point of contact which indicates to him/her to stop anywhere at any time. This final 4-week stage in training is taking the foundation back to the field. You can expect at the end of your dog’s time here he/she will be ready to hunt. 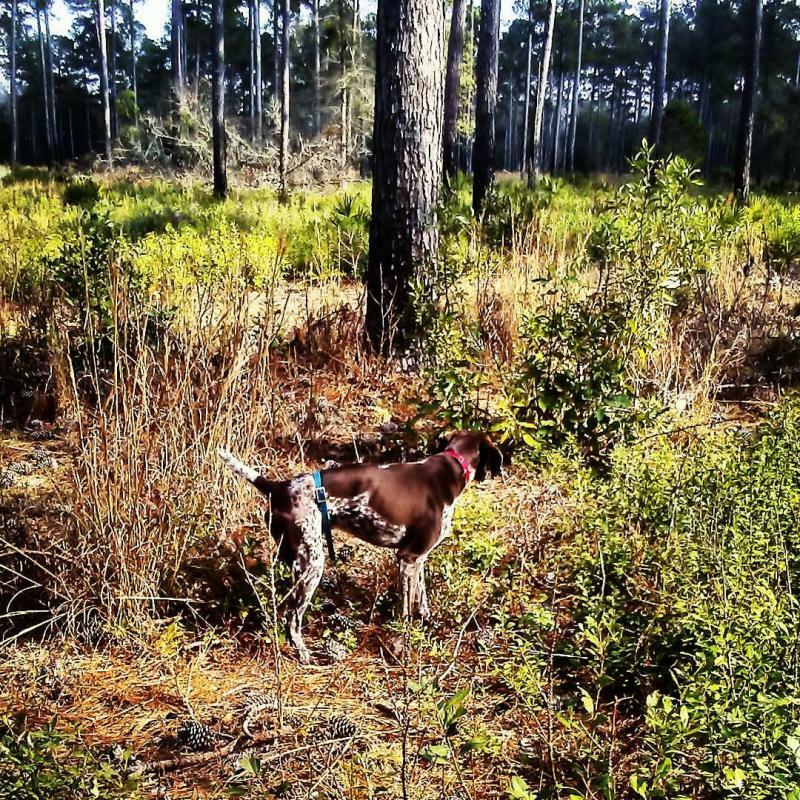 Your dog will have been taught all areas of which he/she needs to respect during a hunt. He/she will make a great companion in the home along with the field, will be happier, and will seem to have matured years. This stage in training elevates what we expect from your Retrieving Dog. At this level, we will focus on your dog’s natural retrieve. Because a Flushing/Retrieving dog’s natural tendency is to retrieve, they naturally want to flush. We will not discourage this behavior, but we will isolate it to fit our method of “train to retrieve” not “force” breaking. 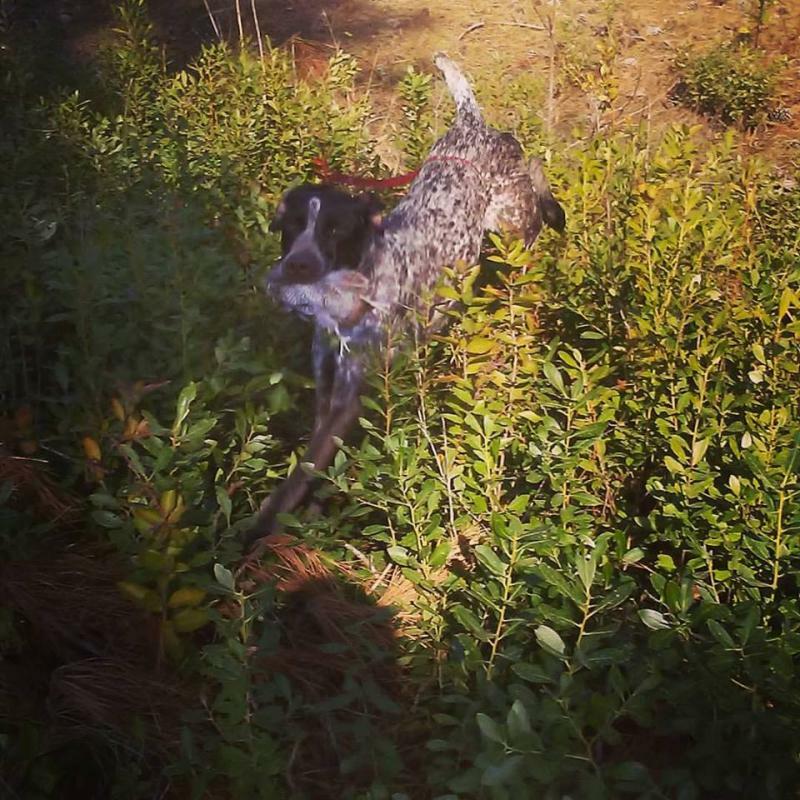 The train to retrieve method is about encouraging the natural instinct to pick up a bird with a strict form of obedience. With this method, your dog will be taught heel, sit, and here. Once these three commands are mastered we will move onto teaching your dog to hold under control. Your dog will learn that once an object is established in his/her mouth they must hold it until asked for it (which will always be from the sit/heel position). Your dog will be asked to hold a multitude of items from a paint roller, to dummies, to frozen birds; while walking under control with whatever they have been given until we ask for it. Once your dog is confident in “holding” we will add our first pressure to encourage your dog to reach out and grab for the objects. When this is done properly very little stimulation is required. Once your dog starts to grasp for objects from our hand we will transfer the object to the ground and add distance. At this point we add the command “Fetch”.